This page features the best ski resorts in Veneto's Dolomites. To view our guide to the ski resorts in Piedmont, which are among the best ski resorts in Italy, click here. The first Italian town to host the Winter Olympics way back in 1956, Cortina has remained one of Italy’s most popular ski resort and remains one of the best ski resorts resorts in Italy and indeed Europe. Cortina d'Ampezzo has everything you could want, great skiing from beginner to advanced, a lively après-ski scene and some very good shopping – the huge Cooperativa di Cortina is like no other shop I have visited. I don’t really know how you would describe it, it is sort of like a shopping mall but different and they obviously have been doing something right, the place has been around for over a century. I tend to get distracted by shops so let’s get back to the skiing. 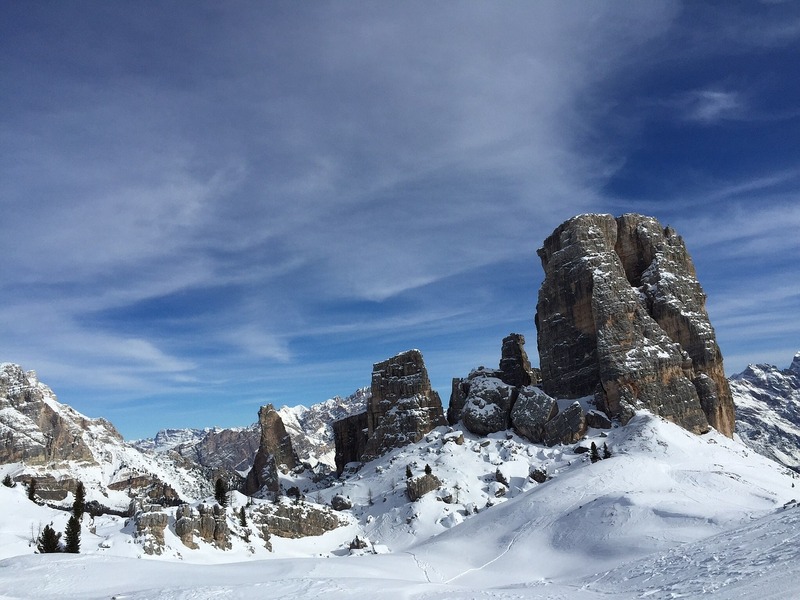 With 75 runs totaling over 100 kilometers, 37 ski lifts, 60 kms of great cross country skiing and plenty of red, blue and black runs Cortina d Ampezzo has something for all levels of skiers. The area has some great powder runs for snowboarders too. The ski runs on the Tofana slopes are legendary, in particular the very difficult Black Canalone run. Nearly half the runs have snow-making machines so you are pretty much assured of some decent skiing even early in December and late into the season. 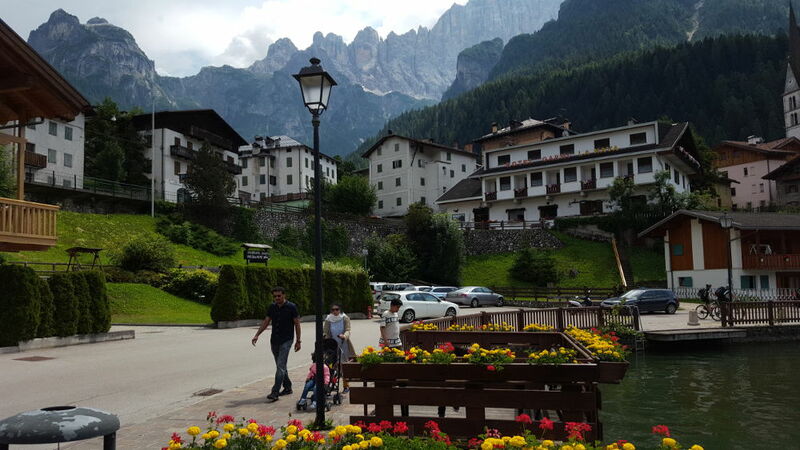 Cortina d’Ampezzo hotels and bed and breakfasts are plentiful but to be honest many are terrible, especially in season the service can be appalling. I really like the Hotel Menardi, which is, in my opinion, miles better than anything else. Click here for more on the hotel. Not a candidate as one of the best ski resorts in Italy but it is a typical little Veneto mountain village and an ideal place to get away from it all while enjoying some pretty good skiing on slopes ranging up to 1600 meters. San Vito doesn’t have that many runs, around six in all, and three lifts but it is a pleasant town to spend time in. Great for the less fanatical skier and being so near to Cortina you can always find a whole lot more skiing should you get bored with the skiing in San Vito di Cadore. A ski-bus runs regularly from San Vito to Cortina and it's free for Dolomiti Superski pass holders. Right in the centre of San Vito you will find the Park Hotel Ladinia, if you have young kids, like us, then it is perfect ski resort for children with a huge playroom and lots of activities. I also enjoy the spa which is free to use for guests. A good restaurant is the final cherry on top. A lovely little town, situated in a bright sunny valley and surrounded by amazing mountain peaks with Marmolada to the north being the highest. The whole area is full of fabulous little resorts and characteristic villages. The Falcade ski resort has some of the best skiing in the Dolomites. Over 100kms of runs and around 60kms of cross country runs with 28 lifts and excellent snow making capability means you are assured of good skiing throughout the season. Falcade is particularly well know for its Lovers Run (Pista degli Innamorati), a ten kilometer run from Col Magherita to Falcade which passes through some lovely scenery. Falcade offers runs from beginner to advanced. Definitely try to get a booking at the very popular Hotel Pensione Dolomiti. Can't get in there then these are the other hotel options in Falcade. Alleghe, like San Vito, may not be one of the best ski resorts in Italy however it too is a lovely little town with a picturesque lake which, in winter, is very popular with ice skaters. I am told that many of Italy’s top hockey players grew up in this area. Alleghe is part of the Comprensorio Sci Ski Civetta region which includes many other surrounding town, most famous of which is probably Selva di Cadore. Ski slopes in the Ski Civetta are excellent too, with 45 runs in the near vicinity and 27 lifts of various types reaching up to around 2000 meters. Most of the runs are in the red or blue category making the resort better suited to intermediate or beginner level skiers. For more about Alleghe click here. Although a little outside of Alleghe, about a kilometer or so, I would recommend the Hotel La Maison; a homely family run sort of place with large and spotlessly clean rooms. Asiago is the nearest major resort from our home in Piovene Rocchette and is particularly well known for its 500 kilometers of Nordic or cross country routes which are used to host the dog sled races that are held here during the winter. If you don’t like cross country skiing and you left your dog and sled at home then don’t worry Asiago offers a lot more, from downhill through to freestyle and even ice skating and ice hockey are possible and indeed popular here. One of Italy’s top ice hockey teams hails from the town. The ski season runs from early December and some of the most advanced snow-making machines in Italy ensure that their will always be great snow. Runs of all types guarantee that whatever your level you will find something to match and in all categories the runs are varied and offer some of the most spectacular scenery in the Dolomites. In total there are 35 blue runs, 32 red and 15 black. Asiago boasts a pretty impressive après-ski scene with loads of bars, restaurants and night clubs. Great value and breathtaking views is what you can expect from the family run La Baitina Hotel - my only choice in Asiago. Except for cow bells nothing much will disturb your peace and quiet. Recoaro Mille is easily reached from the famous spa town of Recoaro Terme with the result being you can easily combine your ski holiday with some stress release in the hot spas of Recoaro Terme . Recoaro Mille, at 1620 meters, is a spectacular ski resort and although there are not a great deal of runs you will find something to suit from blue all the way through to black. If you are coming to the Veneto by plane then you will probably land at Verona, Venice Marco Polo or Treviso airports. All of the airports are close to top ski resorts. In my opinion the best way to travel to the resorts is by car. For more info on car hire though I would suggest you read our car hire guide . Prefer to use public transport? You can catch the train to Belluno from Verona and Venice although most trains will involve a change at Padua. From Belluno buses run to most of the ski resorts. If you have skied in Italy you no doubt have a great story to tell? Share it and help us in our quest to discover the best ski resorts in Italy!